OKLAHOMA CITY, OKLAHOMA–Energy Assist Foundation, Santa Fe South High School, Musco Lighting, and the U.S. Soccer Foundation have teamed up to unveil a new soccer mini-pitch in Oklahoma City on Friday, April 5th from 11:40-1:00 pm at Santa Fe South High School – 6921 Plaza Mayor Boulevard, OKC, OK 73149. The public is invited to attend. Built on a hard surface area, futsal courts (a.k.a. mini-pitch) are a form of soccer played within a fenced or walled area, often seen in high density neighborhoods where kids may not have access to a full size soccer pitch. 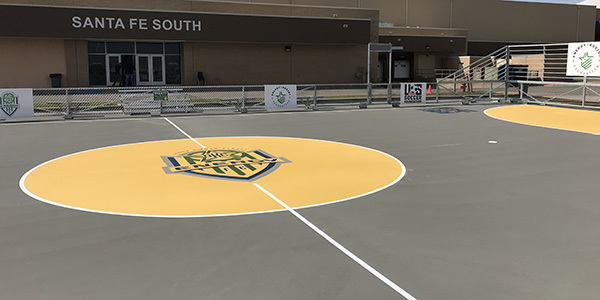 In Oklahoma City, each new futsal court constructed by Energy Assist Foundation will provide a safe place to play, while increasing access to youth soccer for the kids in each community. Research indicates participation in after-school soccer programs can have a significant impact on the development of teamwork skills, can motivate kids to try harder in school, and can help them avoid anti-social behavior. The new mini-pitch at Santa Fe South High School will serve as a positive outlet for local youth to not just play soccer, but also develop critical life skills, boost confidence, and aid in their personal growth both on and off the pitch. Mission Statement: The purpose of Energy Assist Foundation is to encourage and support youth sports and community initiatives that improve the quality of life in Oklahoma and help children reach their full potential through positive experiences and role models. Headquartered in Oklahoma City, OK., the Energy Assist Foundation is a 501(c)3 charitable organization. be matched, and is the solution of choice for neighborhood fields, collegiate and professional stadiums and arenas, international speedways, and global events such as the Olympic Games. Musco backs its LED solutions with a long-term warranty covering parts and labor, eliminating maintenance concerns and costs for its customers.